Miss Philippines is attracting more attention than the Miss Universe winner 2010 herself! In fairness, according to this news, it's one difficult question to answer considering people's nature of not wanting to admit mistakes in public. Look, even a former US president had a hard time responding. So what should have been the best answer? 2.In my 22 years of existence, I have not any big mistakes. Pramis! I am only about to commit one right now. As in NOW na! 3. Mr. William Baldwin The biggest mistake I have ever made in my life was to pick your name in that fish bowl. May I switch questions with Ms. Mexico please? 4. (Smiles sweetly, waves to the crowd and shouts) World Peace! Thank you all that I am here! Labels: headlines, kikay writes, showbiz, what did you say? I have been trying to avoid writing to you and about you. It's been very difficult lately to even think about you. I miss you terribly, that's why. I came to visit you in June, before I left for Sydney. I guess I'll always have that practice of seeing you and mom before going overseas. Anyway, I am not sure if you saw me because I stood there only for about a minute. I am sure it wasn't more than that. Seeing your picture on that glass door that separates you from me was too much to bear. I saw again your smile - that smile that seems you are about to break into a fit of laughter. I miss that, Daddy. I couldn’t stand it so I left, in a hurry and in tears. My little boy looks so much like you. Being your daughter who inherited your sense of humor, I named him Enoe. Yes, the reverse of Eone's name. The heck if people need to read carefully when I put their names together in one sentence; that's their name and I love it. Don't you? By the way, our Rodgie is getting hitched on Saturday and she asked Jing to walk her down the aisle on your behalf. Although honored by the request (of course Jing relented), we’d rather that it is you who gives her away. This is going to be a major event in her life and it would be even more special if only you had lived to see it. On the lighter side, we didn’t have to worry about fitting you into a Barong or a formal attire which the stubborn you would surely refuse to wear. No more tears this time! Haha! Daddy, admit it. You've been scheming all this, aren’t you? Tell me, have you been eating all your broccoli in heaven that you were able to convince God to agree with your grand plan? It's too much coincidence that I got pregnant and Gie met Eugene almost instantly after you left! You know I am such a cry baby and if I have Enoe, I'd be so happy (and busy) I wouldn’t cry so much thinking about you. I will love him and he will love me too. That's so sweet of you Dad. Even after you're gone, you've never stopped loving us. I love you too. And as I always say every time I think of you, I miss you. I will never stop missing you. I will be posting pictures of the wedding but please don't bother to comment, okay? So I turned 35 yesterday. Three and a half decades old, my golly! They say life begins at 40, then considered as midlife, to sort of pacify the worry of getting old. But that was when people lived to be at least 80. Since average lifespan is now just about 70, 35 is the new midlife. I have just joined the club. I don’t know how this midlife crisis works? I suppose it starts with worrying about getting wrinkles and white hair and all the aches that comes with ageing. Then people around you start dropping unsolicited advices on creams that reduce fine lines, some sour juice to detoxify and names of skin care clinics that offer the cheapest botox. I recall my mom in law recently have reminded us to start getting more veggies into our diet as we are "not getting any younger". Ouch! So life begins at 35? It certainly does. Actually, life for me began when I became a mom. Although it marked the end of what I call 'freedom' such as late nights out, unnecessary shopping spree, and unplanned vacations, holding two beautiful kids in a loving embrace is the greatest trade off. I have unknowingly but happily switched from designer bags to diaper bags, red stiletto shoes to unfashionable flat slip on, silk scarves to burp cloths, last full shows to late night feedings, to name a few. 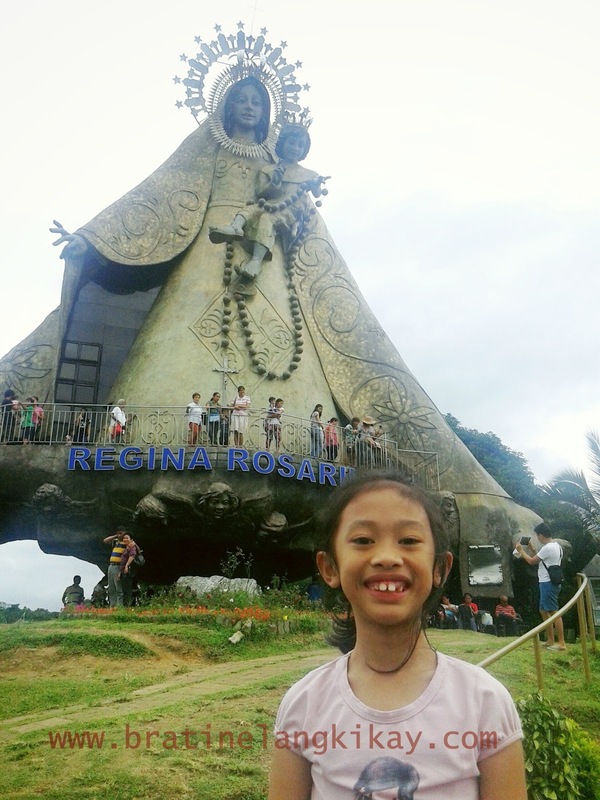 That's quite a change for a kikay like me, but every single smile of my little ones is worth the sacrifice. Anyway, some friends were expecting for a wish list that I normally write before my birthday. The list, that friends can refer to when buying a gift so they know what I really like, was something I attempted to write many times for 2 weeks but I could not get past No. 1. The Hubby, too, asked me what sort of gift I want for my birthday; I gave it a long, hard thought and came up with nothing. I guess when you get older and hopefully, wiser, material things become secondary. All I can ask for now is good health so I can spend more fruitful years with my children. And yes, I want world peace. I guess this is what midlife crisis is exactly all about...being mushy and gushy and thinking about all the drama! 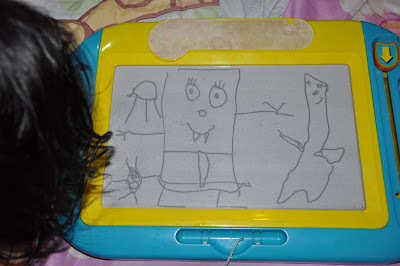 I guess anyone can tell from this drawing how much my little girl likes Spongebob. Yes, that box with a stick that looks like a vampire is Spongebob. Beside him is Patrick, looking more like Casper than a sea creature. Near Spongebob's foot is Plankton, the villain whose existence is fuelled by the need to steal the recipe of Mr. Krab's Krabby Patty burger. I dont know what's with Spongebob Squarepants that kids adore. I find him weird. A yellow sponge that lives in a pineapple under the sea, keeps a snail for a pet and has a squirrel (that looked like an astronaut) for a love interest! But I must admit this character has got quite of a following. When I was preparing for Eone's birthday last month, I had gone through every corner of 168 Mall just to find Spongebob bags for party give away. I was told it's the most in-demand kiddie party material in the whole universe of Divisoria. I couldn't agree more because Mommy and I even had to walk to another mall to find a Spongebob pinata. I guess it's the way the Nickelodeon people are marketing the character. There must be some hypnosis going on because children are just so glued to Spongebob. Looking back, the last time Eone had been so engrossed with a character was with Barney. Around that same time, my friend's son was so much into Barney too, that he suspects there is something 'evil' about Barney and the promoters are using some form of witchcraft to make kids love that purple dinosaur. That's a funny theory but not impossible.